One of the Twelve Minor Prophetic books, the book of Micah contains the famous quote "what does the LORD require of you but to do justice, and to love kindness, and to walk humbly with your God?" (Micah 6:8). However, many of us do not know the circumstances that led the prophet to these famous words. This serious commentary by Daniel Smith- Christopher analyzes the historical, social, and literary context of the book of Micah. Smith-Christopher presents a challenging perspective on Micah, who is here represented as an angry opposition figure to King Hezekiah and the Jerusalem elite. In Micah, we hear from those Judeans who suffered Assyrian, and later Babylonian, force but who hold Jerusalem's military folly to blame as much as the Empires of his day. 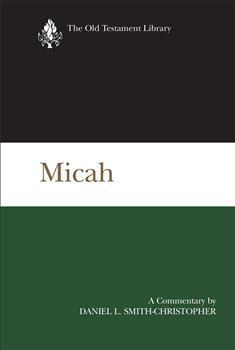 Smith-Christopher's fresh reading of Micah is a stimulating addition to the Old Testament Library that will well serve both the academy and the church. The Old Testament Library series provides fresh and authoritative treatments of important aspects of Old Testament study through commentaries and general surveys. The contributors are scholars of international standing. The editorial board consists of William P. Brown, William Marcellus McPheeters Professor of Old Testament, Columbia Theological Seminary in Decatur, Georgia; Carol A. Newsom, Charles Howard Candler Professor of Old Testament, Candler School of Theology at Emory University in Atlanta, Georgia; and Brent A. Strawn, Professor of Old Testament, Candler School of Theology at Emory University in Atlanta, Georgia.